At Johnston we pride ourselves on working with the best manufacturing partners. Maintaining strong partner relationships ensures you’re able to achieve peak results for your business. 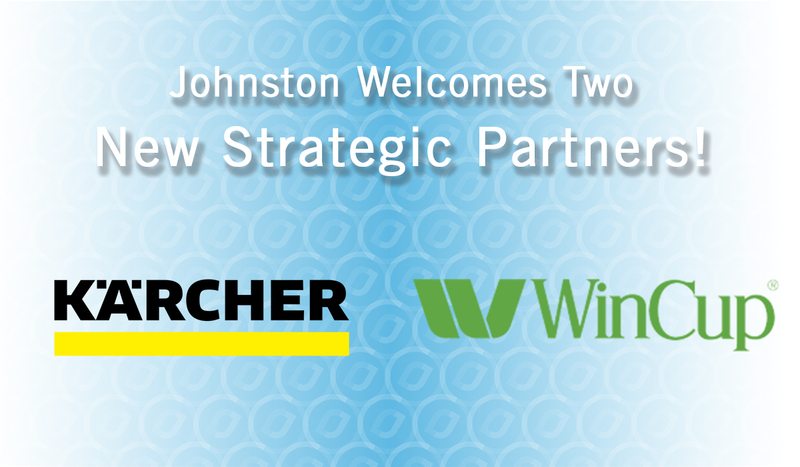 Kärcher & Wincup share two qualities that we value above all else at Johnston: Innovation and Teamwork. We’re excited to be working with them to serve our customers’ unique needs with game changing technology and products. Kärcher is a leading worldwide provider of cleaning technology and equipment. Like Johnston, they are passionate about offering innovative solutions paired with exceptional advice and service. They boast an enormous product line including sweepers, scrubbers, vacuums, burnishers, carpet cleaners, steam cleaners, pressure washers and much more. One highly recognizable brand name falling under Kärcher’s umbrella is Windsor, now known as the Windsor Kärcher Group. Kärcher is also passionate about participating in the community. For more than eight years it has been equipping SOS children’s villages with cleaning equipment and building green filter plants together with the Global Nature Fund in developing and emerging nations. As part of its cultural sponsorship program, Kärcher has cleaned over 140 monuments worldwide since 1980. The statue of Christ in Rio de Janeiro, Brazil and the sculptures of the heads of presidents at Mount Rushmore are two examples. Wincup is a leading manufacturer of disposable polystyrene cups, bowls, containers, straws and lids committed to providing high quality products and superior customer service. Wincup will prove to be a valuable partner to many of our customers in both institutional and retail foodservice as well as our OEM/food processor customers. Not only do they offer an extensive array of versatile container designs, but in addition they bring a strong focus on innovation and environmental responsibility. Foam gets a bad reputation for being harmful to the environment, despite being able to be recycled. The problem is that many areas of the country don’t offer foam recycling. Wincup thought about the amount of foam that could be finding its way into landfills and decided to make a difference. Through rigorous research and development processes they have brought to market the Vio® line of biodegradable foam products. This amazing new line of cups and bowls biodegrades 92% in 4 years. Interested In Learning More About These Lines? Fill out the form below and a Johnston expert will reach out to tell you more!